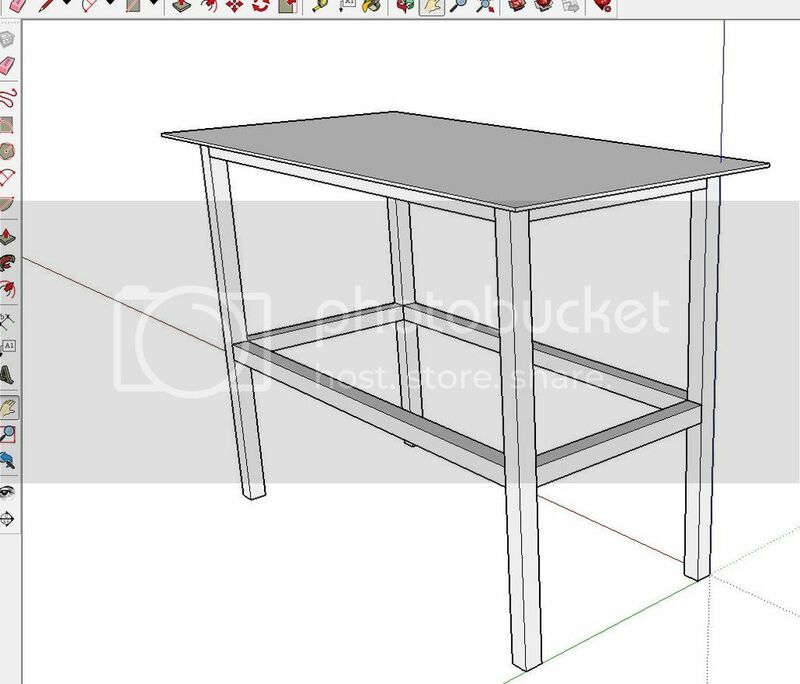 For my first project I want to build a small welding table. I've looked on a few sites about what people are using and I'm purely a hobbyist. Many of the tables are elaborate and fit peoples specific needs and are much larger than I want. On Easter my dad and I went to the neighbor who builds hot/rat rods. He had a table that I thought would be perfect for what I wanted to do. I don't have any plans drawn up but wanted to start thinking about it. His table was 18" deep and 48" wide. What do you recommend for a height? How thick of a top? Would 2" x .125" wall square tubing be adequate? Should I have holes drilled in the top for clamps? I would like to mount a chop saw flush on the right side and also make a reciever port so I can put a grinder on/off the left side. The chop saw being on your actual welding table most of the time will get old, quickly. Most of your questions are very dependent on what kinds of projects you are going to be fabricating. Thickness of the table top is usually decided by budget more than anything else. Get as thick of a table as you can afford, unless you need portability. That square tubing will probably suffice for most tables structural members and legs. Don't worry too much about getting everything perfect the first time. It's not possible. Build a table and THEN decide how to improve it. You're a weldor now, you can fix it. My table is 30" tall, I am 5' 7". Top is 48" x 96" x 1". It works good for me. I have a desk chair on wheels for sitting jobs. I do a lot of stuff that is bigger so when it's on the table it is a good working height. I can also hop up on the table somewhat easily as needed. The height is also just low enough for muscleing heavier stuff up on to it. At a fab shop I worked my table was 35" high. I did not like it that high. The extra 5" really made a difference for me. As MAC702 said it depends on what you will work on mostly and how tall you are. If you make it shorter you can always block it up as needed. For materials I would use 1/4" plate minimum for the top. If using 1/4" I would see if you can get someone to bend a 1-1/2" lip on the long sides (facing down) as this will significantly add to it's strength and allow you to skip the top frame and just add legs with cross braces. If you go heavier then skip the bending idea. Square tube, pipe or angle will all work for legs, etc. The heavier it is the more stable it is, especially if you use a vise on it and are really pulling on something. I would think 24" minimum width. As far as holes go it won't hurt to have a few but I just put them in as needed or tack the pc. to the table if needed. Again figure out what you think you will be working on. If it's going to be used more of a mechanics bench then maybe taller as you will most likely be standing most of the time. Tig work or intricate little parts then desk height as you will probably be sitting most of the time. Anything permanently on your table will be in the way. Sparks from grinding and welding will also be going on it all the time. Last edited by MMW; 04-19-2017, 05:48 AM. Our welding tables are 34 3/4" tall, 4' x 8' x 1/2" top we have parts carts that are 24" x 30" also 34" tall so for larger parts the carts can be used to extend the table. Everything is on wheels! Also consider the space you're putting it in. If you have a shop the size of a football field, it wouldn't matter. If you're tight for space then build accordingly. Having a table you can walk all the way around is helpful sometimes too. Having something on wheels is an advantage as well. There is no perfect welding table. My first welding table was built completely out of salvaged rebar. I worked off it for years. Here is what I'm looking at. I switched to 1.5" tube with .125" wall. 1/4" top that a buddy has. Nothing wrong with that. Just get it built! Only after using it for whatever kinds of things you do will you be able to say: "It needs _________." I would move the longer lower shelf braces inboard some. This will give you more leg room if you use it with a chair, like a desk, and won't sacrifice stability. You only need a few small welds to hold the top on. If you make big welds it will warp and/or pull the edges down.